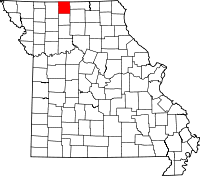 Mercer County is the second least populated county in all of Missouri, with only 3,700 people residing there, approximately. There are only two towns in the county, Mercer, and the county seat of Princeton, which is where all of the local departments and organizations related to record keeping are located. The Circuit Clerk also acts in the capacity of the Recorder of Deeds and is situated in the Mercer County Courthouse on 802 E. Main. Being that the two offices are combined, individuals can research and obtain copies of all county records there, except for births and deaths which are maintained by the Mercer County Health Department located on 305 West Main. The Mercer County Genealogical & Historical Society also operates out of Princeton from the Mercer County Library on 601 Grant Street. The Society has a large number of records on file that are available for research, and they will also perform research requests.